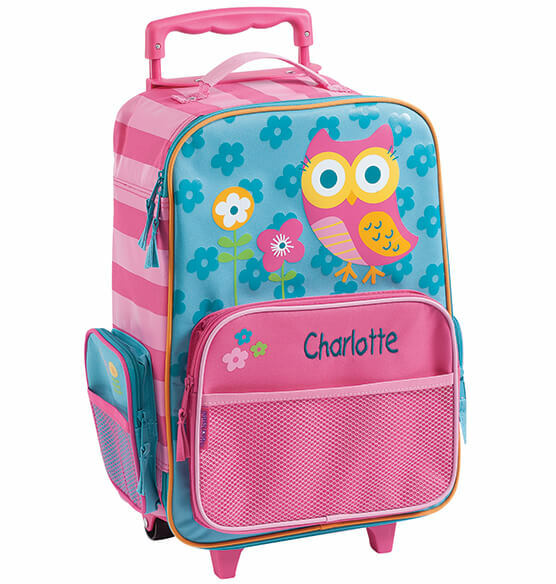 Just like Mom's, but oh-so CUTE ... this Personalized Stephen Joseph® Owl Classic Rolling Luggage is such a "hoot" when personalized for one little traveler! Boasting the high-quality features parents love, the adorable owl suitcase offers plenty of room for packing, yet is the perfect size and height for kids. The classic rolling childrens luggage features a generous main compartment—with a zip closure, plus open mesh pocket for easy access to travel essentials like candy, puzzles and toys. Featuring a cute owl design on bright colors of pink and blue, it's easy to spot on the luggage carousel—and simple to identify when personalized with one special name!